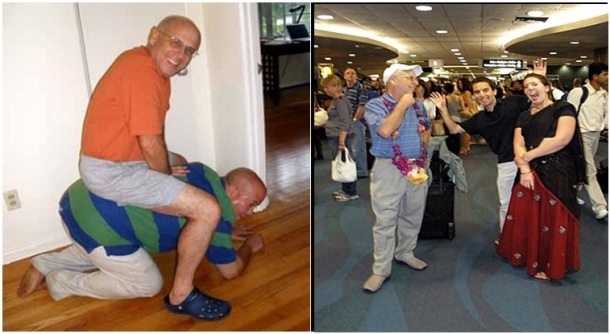 Prabhupada Vision: Madhava Dāsa – USA: The ISKCON CIRCUS continues to amazes me with all the opportunistic shenanigans that are going on in the name of ‘preaching’ and pseudo devotional service. The latest one is that of women vaisnavis becoming the rubber-stamped institutional gurus. The GBC accepts the basic philosophical conclusion presented in the SAC’s Female Diksa Guru Paper, i.e. that a mature, qualified, female devotee may accept the role of an initiating spiritual master. The implementation thereof is pending further GBC consideration. 2. The GBC Body authorizes local area committees to put forward for approval as initiating guru any devotee in their area, male or female, who is qualified according to existing GBC Law. However the Indian RGB/ISKCON Bureau (GBC Bureau for India) is strongly opposing this resolution with a paper that was presented to the International GBC, in the attempt to revoke the above resolution that approves institutionalizing women gurus in our ISKCON society. Therefore, the IRGB humbly requests the GBC to suspend both resolution 305 of 2009 and resolution 425 of 2005 until in depth discussion on the topic can take place with representatives of both points of view-pro and con. Naturally after hearing of this rebuttal the liberal opportunistic ISKCON apologists (Feminist), vaisnavis and their male counterparts, are lashing back at the RGB/ISKCON Bureau to even dare and question the above ‘already approved’ GBC resolution. The battle between the two camps is set to take place in the upcoming GBC (clandestine) meetings within a day in Tirupati India. It is important to note that this is not the first time that the International GBC and Indian GBC are at loggerheads with each other which is especially so since ISKCON India became extremely successful financially compared to the other parts of the world. For quite some time now, the International GBC (mainly comprised of the members from North American GBC) are attempting to take full control over the Indian GBC which would have a far reaching consequences for ISKCON India in terms of policies, programs, but most importantly the control of the huge financial catchment zone that the ‘assets’ in India (Lifemembers/donors) are generously and constantly generating, and the decisions of who, how and where this money should be appropriated. ISKCON India (with exception to religiosycretic/liberalistic, new age apologist/businessman Radhanath swami and his camp) are fully aware that if International GBC is successful in their attempt to usurp its full control in India, they will automatically and irrevocably implement all their liberalist practices that ISKCON India will be force to swallow and follow. What to speak of the money transfers that will take place, once they get their hands on it. The International GBC will most probably employ Braja Bihari das, the mediator extraordinaire, to ‘mediate’ and RESOLVE/ABSOLVE the apparently irreconcilable differences and homogenize them in favor of the International GBC and his own personal liberalistic agenda. What most are not aware of is that Braja Bihari is the main advocate behind the group that has a strong vested interest in women becoming initiating spiritual masters in ISKCON – the ex women principles of the old guard Gurukulas. He is also the main guiding force behind the move to make ISKCON more politically correct / liberal thus ignoring/rejecting the teachings of Śrīla Prabhupāda and the past Ācāryas that do not fit their agenda. “Prabhupada: So-called gurus, they are so-called gurus. They are not gurus. That is already explained. If one does not speak what Krsna speaks, he is not guru. If you accept so-called guru, that is your misfortune. What can be done? So here we are in the ISKCON circus today, where the show must go on at any cost. The GBC are not interested in ‘TATTVA DARSHINAH’ as given by Śrīla Prabhupāda and the previous Ācāryas all the way up to Lord Kṛṣṇa Himself and they are more interested in modernizing of liberalizing our Vaiṣṇava society with this move to implement ‘affirmative action of expropriation’ and appoint equally unqualified women to occupy the post of rubber-stamped guru. A rubber stamped guru who by the way has only to maintain the mere minimum of standards set by Śrīla Prabhupāda of following the four regulative principles and the daily chanting of sixteen rounds. Opportunism definition; Practice of exploiting circumstances in self-interest, especially without regard to moral principles or others’ interests. Opportunist definition; One who takes advantage of any opportunity to achieve an end, often with no regard for principles or consequences. Comically, those were the very same standards that were set by Srila Prabhupada, as eligibility for individuals to take first initiation only (harinam) yet these liberal prabhus are equating the same neophyte standards for somebody who is qualified to be the diksa guru, someone who is responsible to give the disciples shudha nam and take them back to Godhead. Really? How did they come to that conclusion we wonder and ponder while scratching our heads? Yet here we have Srila Prabhupada answering to the direct question as to what is the qualification of a dīkṣā Guru? 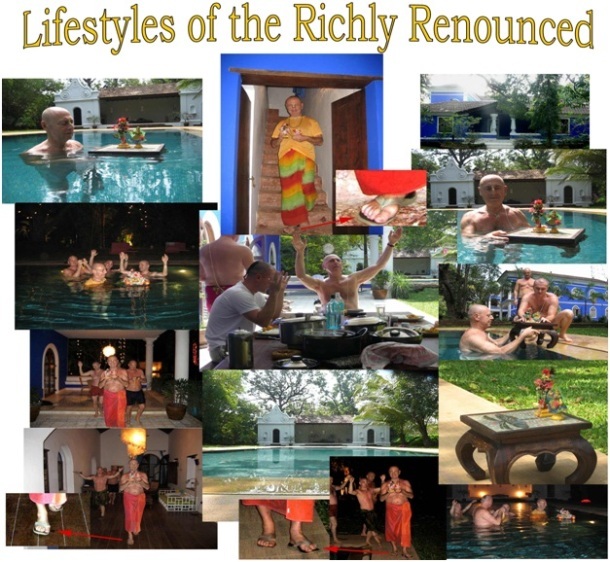 Due to the controversial systematic lowering of Srila Prabhupada`s given spiritual, philosophical and cultural standards by the hands of opportunistic liberalist devotees, we are seeing ISKCON’s opportunistic gurus and sanyasis spending hundreds of dollars per night for their regular stays in luxury hotels/resorts, forcing them to go ‘incognito’ hiding in their karmi clothes, mixing together with other karmis and their ‘secretions’ in unclean facilities such as swimming pools, saunas, etc. They are keeping all the wealth they collected from innocent naïve devotees in private bank accounts without any accountability. They are purposely registering all their projects into privately owned corporations/trusts. They are secretly buying their privately owned houses in exotic places. Freely mixing, mingling and enjoying the company of women and little girls. The renounced order of life is never meant for begging or living at the cost of others as a parasite. According to the dictionary, a parasite is a sycophant who lives at the cost of society without making any contribution to that society. 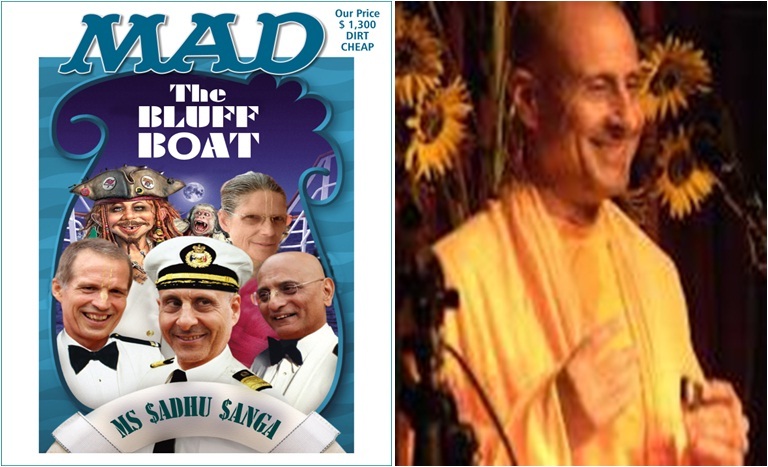 Here we provide a MUST SEE video clip that really illustrates these opportunistic “gurus” for what they really are…merely CLOWNS IN ISKCON CIRCUS…and a JOKE. Please, also carefully listen to the lyrics that accompany the video which labels the personal activities/lifestyles of the participants in the video remarkably accurately. Now here we are having all these institutionally approved man-gurus, behaving raving mad, that are totally intoxicated with delusions of grandeur, of who they really are. Can we really believe that Liberal chauvinist/masculine women of ISKCON will do any better? Hence, due to their ruthless ambition and the need to control others, we will be calling these women the liberalist/modernist vaisnavis. Urmila d.d. who was involved in educational system of ISKCON, running family managed business like gurukula under auspices of Bir Krsna swami/guru in North Carolina who was involved in cover up of the abuse perpetrated by the family member. The school was abruptly closed town without any appropriate information. She is also known for her in-famous condescending classes, whereas she is talking down at the adult audience as little retarded children. This is all part of her Neuro Linguistic Programming (NLP) technique, whose aim and purpose is the subtle manipulation of the recipients, into suggestive state of mind where they can be easily manipulated and controlled. Urmila d.d. did ask GBC on two occasions to become a guru however she was turned town on both occasions. Will she fair better this time we wonder? Is this the stark future that is ISKCON heading towards? Can you imagine these masculine vaisnavi`s like Prasanta d.d, Malati ‘swamini’aka “the madam of forbidden delights” and their attitudes and behaviors once they reach their desired goal of the membership of the ‘untouchables – jet setting guru club’ is obtained? We all observed drastic unhealthy changes in the unqualified men once intoxicated with the total power and control over others via worship and huge personal money donations because they are as good as GOD? Since men in general are little less emotional and neurotic, then who knows what kind of hydras and dragonesses’ these masculine women will they turn into when they assume the mantle of a God-dess on earth guru? What to speak of the fiasco if and when they will start to initiate young (cute) boys… I guess they could follow Indradyumna`s poor excuses for the need to play with little cute girls. They will say they are merely their mothers, aunties and grandmothers… right? After all when Indradyumna was exposed for his peculiar interest in photographing little girls in bathing suits or women in bikinis it forced him to remove those vulgar photographs from his Facebook page forcing him to face the fact that there is something wrong, something abhorrent, in his consciousness that drove him, as if a cry for help, to make public his inner desires thus revealing himself as a kaniṣṭha adhikāra devotee at best. Below is a screenshot from the PrabhupadaVision Facebook page where a discussion occurred when a supporter of Indradyumna Swami took offense at the comments by some devotees declaring that it was improper for a sannyāsa to be seen closely associating with women, citing the example of the photo which displayed IDS holding a little girl’s hand while leading what could only be described as women on display parade in the way of a Harinama. 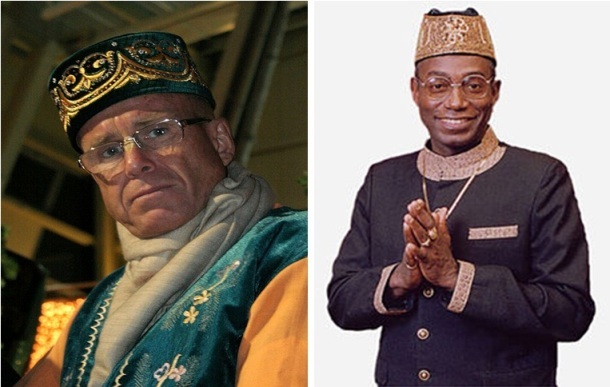 The supporter espouses the ‘racist’ opinion that Indian bodied ISKCON gurus and Indians in general cannot handle the western liberalist ways and only the white bodied gurus were able to preach as they were seemingly not affected by close or loose association with women and western hedonistic lifestyles. He claims that Indian bodied gurus shy away from the west keeping themselves to India as there are no pretty or beautiful Indian girls or women to be disturb them. He even claimed that Lord Caitanya Himself was not able to withstand womanly lures and so kept his distance from women. But his beloved white bodies western gurus like Indradyumna Swami being an uttama addhikara devotee was eminently qualified to. Although giving no evidence from śāstra he claimed that these white western bodied gurus were all of uttama adhikāra status and could therefore disregard God Himself, śāstric injunction and the previous Ācāryas example and do as they please in order to please God Himself… Ummm is this an ‘oxymoron’ or what? Is this the result of following these white bodied rubber stamped gurus of ISKCON? 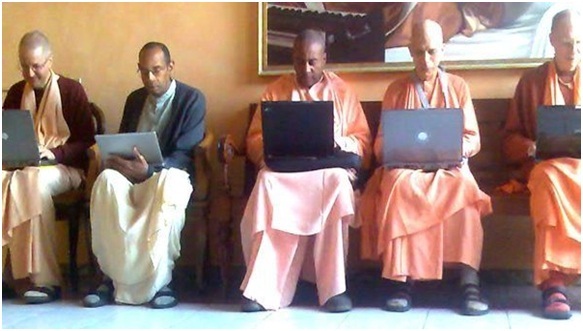 What about the Indian gurus of ISKCON? Will there be any Indian bodied masculine liberalist women up for the post of a guru? Or are the western bodied chauvinist women the only ones who can deal with boys and men? What next institutional gay gurus?